It’s that time of year again in the Algarve. 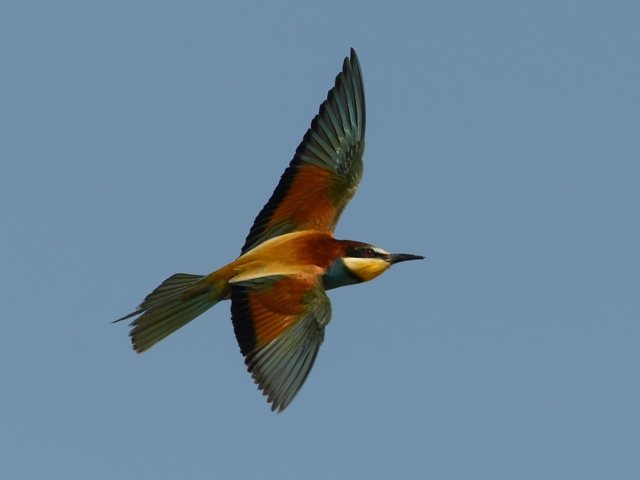 The sun is out, the sky is blue……and European Bee-eaters are busy at the nest sites. Gone are the days when it was possible to hear the excited liquid trills of high-flying migrants moving north. Now Algarve birds are well into their breeding season. 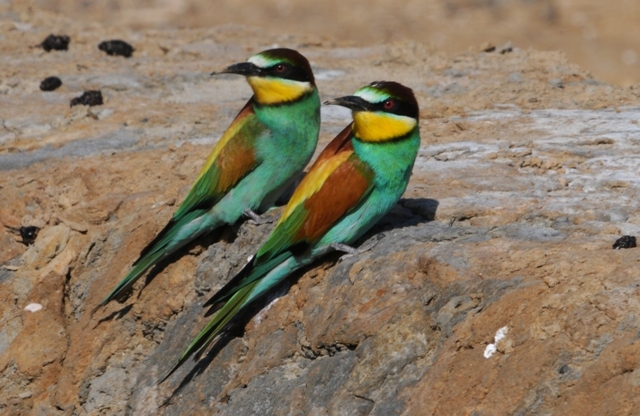 Their rainbow colours, sleek appearance and dashing flight ensure they are a huge favourite with visitors to the Algarve. 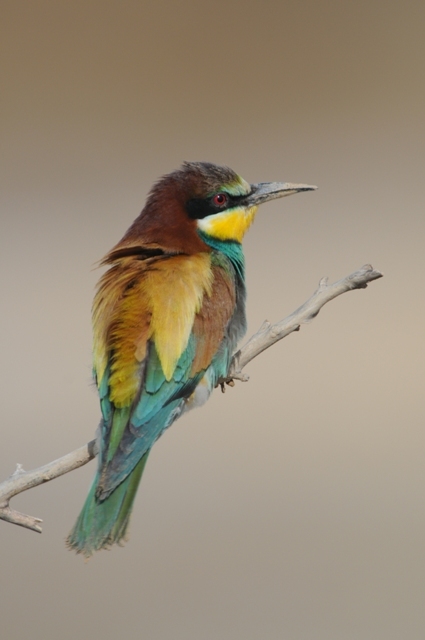 European Bee-eaters, by choice, are faithful to their nesting sites which are occupied year after year unless disturbed or destroyed. On average, colonies are relatively small and usually do not exceed eight pairs. Inevitably, new colonies are established as old ones disappear and this year there are at least three that are active on the outskirts of Tavira. So, I am in the fortunate position of being able to jump in a car and be at any of them within ten minutes. For the bird photographer bee-eaters are a delightful subject. Once at their colonies they habitually hunt from favoured perches to which they return to demolish their prey. 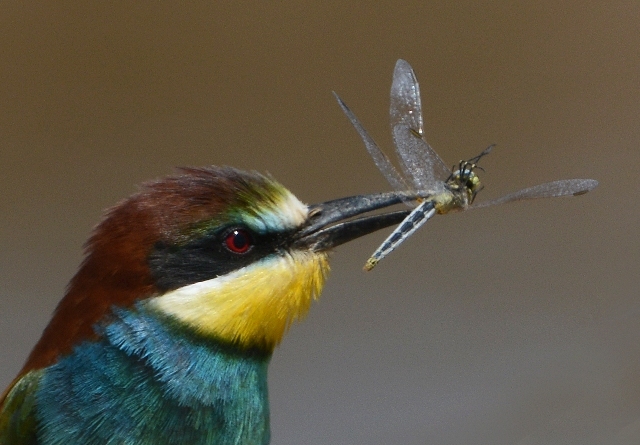 Statistically bees and wasps are the preferred food items of European Bee-eaters although they will eagerly catch and devour other large flying insects, especially beetles, butterflies and dragonflies. It is thought they mate for life. Certainly they are paired when they arrive at the breeding colony. Field guides customarily only ever describe adults and do not differentiate between male and female plumage. In fact, with a good view and especially when the breeding pair is perched together, it is usually straightforward to distinguish the sexes. Females have a smaller russet area on the closed wing and sometimes show a narrower black border to the yellow throat which can appear paler than in the male as can the turquoise underparts. 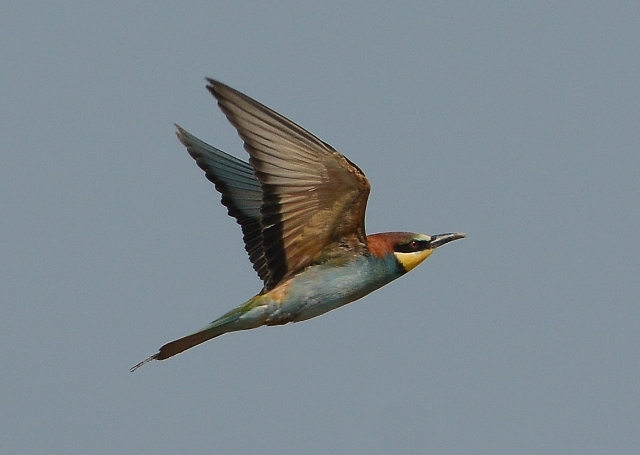 Photographing bee-eaters in flight is a little more tricky, particularly because they tend to fly with the sky as a background and the underwing is in shadow. It is well worth persevering, however, as successful results can be most gratifying.